Europe will be getting new Mario-themed consoles to celebrate the plumber's 25th birthday. To celebrate the 25th birthday of Super Mario Bros., Nintendo released a whole bunch of goodies in Japan including a re-release of Super Mario All Stars and a red Wii with a modded version of Super Mario Bros. pre-loaded. Though these items were expected to reach the shores of the rest of the world, Nintendo only announced the All Stars Wii collection for Europe and remained silent. Now, Europe will continue to celebrate Mario's birthday with the release of two new Nintendo console variants, while North America will continue to wonder if it'll ever get the goods too. Today, Nintendo announced the New Super Mario Bros. Wii pack and the New Super Mario Bros. Nintendo DSi XL special edition pack for release in Europe. 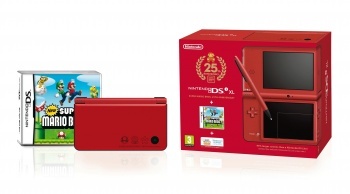 The DSI XL comes in red and features character icons. It's packed with New Super Mario Bros. and will be released on October 22. 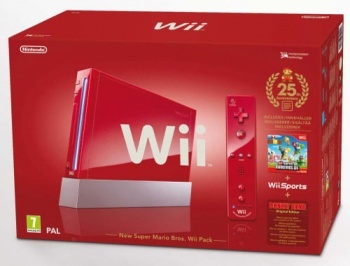 The Wii is also a gorgeous red and contains a new red Wii Remote Plus (with Wii Motion Plus technology built in), a red Wii Nunchuk, New Super Mario Bros. Wii, Wii Sports, and a pre-loaded version of the original Donkey Kong. It'll hit shelves on October 29, meaning that Europe is getting the Wii Remote Plus before the Japanese launch in November, while the controller is rumored to be launching in North America in a bundle with FlingSmash. I'm really not mad, because Europe should be getting all of these Mario goodies, but I can't help being curious about when Nintendo will let North America in on the fun. Super Mario Bros. first came overseas in March 1986, so Nintendo could be waiting until next year, but by then the 3DS will be stealing the thunder of these bundles anyway. We'll keep waiting to see if Nintendo of America makes an announcement.